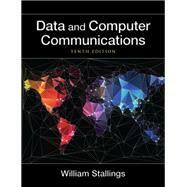 Data and Computer Communications, 10e, is a two-time winner of the best Computer Science and Engineering textbook of the year award from the Textbook and Academic Authors Association. It is ideal for one/two-semester courses in Computer Networks, Data Communications, and Communications Networks in CS, CIS, and Electrical Engineering departments. This book is also suitable for Product Development personnel, Programmers, Systems Engineers, Network Designers and others involved in the design of data communications and networking products. With a focus on the most current technology and a convenient modular format, this best-selling text offers a clear and comprehensive survey of the entire data and computer communications field. Emphasizing both the fundamental principles as well as the critical role of performance in driving protocol and network design, it explores in detail all the critical technical areas in data communications, wide-area networking, local area networking, and protocol design. William Stallings has made a unique contribution to understanding the broad sweep of technical developments in computer networking and computer architecture. He has authored 18 titles, and counting revised editions, a total of 35 books on various aspects of these subjects. In over 20 years in the field, he has been a technical contributor, technical manager, and an executive with several high-technology firms. Currently he is an independent consultant whose clients have included computer and networking manufacturers and customers, software development firms, and leading-edge government research institutions. He has received the prize for best Computer Science and Engineering textbook of the year from the Textbook and Academic Authors Association six times. Bill has designed and implemented both TCP/IP-based and OSI-based protocol suites on a variety of computers and operating systems, ranging from microcomputers to mainframes. As a consultant, he has advised government agencies, computer and software vendors, and major users on the design, selection, and use of networking software and products. Online chapters and appendices are Premium Content, available via the access card at the front of the book.